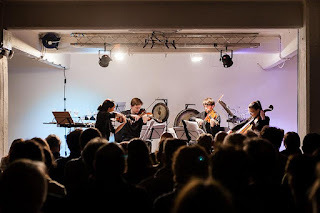 Last night (31 May) New Dots presented the Ligeti Quartet performing George Crumb's 'Black Angels' and a supporting programme by Anna Meredith, William Dougherty, Ji Sun Yang, Wadada Leo Smith and Tom Green. 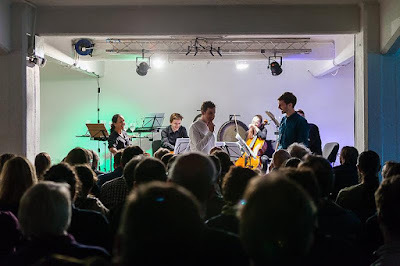 The concert, in Hoxton Basement was beset by broken strings and broken chairs, yet managed to retain (or perhaps because of it) a certain honesty and freshness. The Ligeti Quartet, Mandhira de Saram (violin), Patrick Dawkins (violin), Richard Jones (viola) and Valerie Welbanks (cello), have been playing together since 2010 and are as at home playing Beethoven as they are experimenting with up and coming composers. 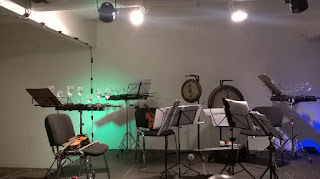 They have collaborated with New Dots before in a workshop which included the composers Tom Green and Ji Sun Yang. New Dots is a organisation dedicated to the promotion of new music. 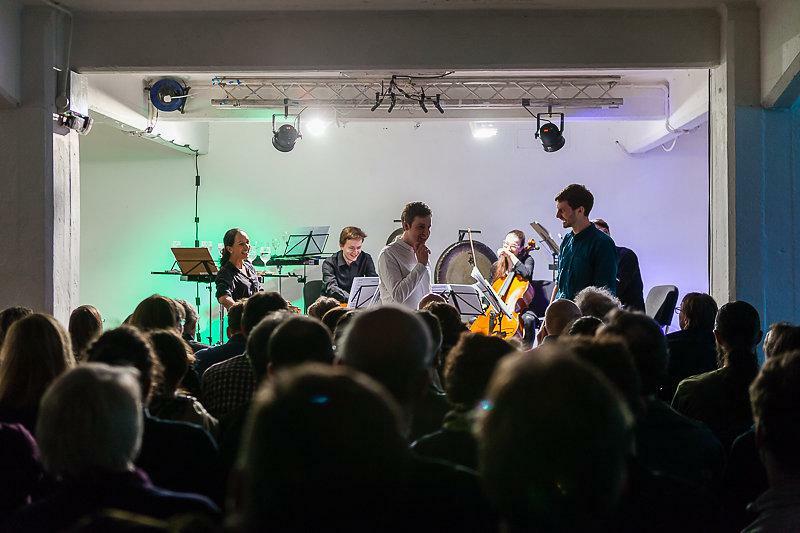 They bring together composers and musicians in concerts and workshops, with the aim of showing audiences how accessible and relevant contemporary classical music can be. Their concerts include talks by the composers about their works, plus tonight there were scores displayed, and an opportunity to talk to the artists after the concert. They have a blog where they discuss the music they are interested in. Although written more than 45 years ago 'Black Angels: Thirteen Images from the Dark Land' (1970) still has the power to excite and horrify. Written to express his feeling about the Vietnam war and social unrest in the US, it juxtapositions classical and experimental techniques, such as playing wine glass harmonicas and gongs, bowing between the fingers and the pegs, amplification "to the threshold of pain", and percussive effects. It has a narrative thread held together by numerology (7 and 13) in three sections: Departure (fall from grace), Absence (spiritual annihilation), and Return (redemption). These are further split into 'images' each alluding to a classical genre such as Bach, Schubert's 'Death and the Maiden', or Camille Saint-Saëns' 'Danse macabre'. The numbers holding together the work are underscored by the quartet shouting and whispering numbers, in several languages and the whole is framed by 'electric insects'. This work is not for the timorous musician. There is a lot to do and it is difficult to do well, and when there is such a seminal recoding as that by the Kronos Quartet it takes brave musicians to give it a go. Instead of trying to reproduce what Kronos did, the Ligeti quartet brought their own interpretation. More natural in sound, it was easier to hear the classical influences (to help there was a little guide to the 'images' projected onto the wall). Some parts such as the viol effect were a little ragged - made impossible by Mandhira breaking a string. But on the whole this was a fantastic finish to the concert. Leading up to 'Black Angels' were five pieces inlcuding two world premieres. 'Music for ravens' by Anna Meredith was written a few years ago (although this was its first outing) when she was obsessed by the idea of ghost birds. With lots of staccato and pizzicato, slides and pecks across repeated motifs, the ghostly ravens were brought to life. Tom Green was asked to write a response to Crumb's 'Black Angels'. For him 'Black Angels' is about objects falling, so in 'Gravity fragments' Green explored shifting gravity, circles and orbits, and objects falling at different speeds. But with hints of a danse macabre that phased away, and a haunting sad tune at the end, he brought more of 'Black Angels' along with him. 'The aureole effect' by William Dougherty is meant to describe the effect of light on rippling water in which bands of light/dark can be seen emanating from a shadow cast on the water. These bands of light and dark were reproduced in musical form with alternating crashing clashes versus harmonics. Different bow pressures were used to produce an interesting effect - perhaps the rippling of the water? This was followed by Ji Sun Yang's 'Les accordéons V' in which she tried to capture the movement and sound of an accordion. By use of overbowed grating she got very close to the wheezing of bellows - the sound before a note is played. Some high pitched pizzicato and harmonics led into a fractured dance that didn't quite come into focus, before being smashed by con legno and percussive effects. During one of the hammering sections the viola broke a string and had to continue on three. Wadada Leo Smith (1941-) was a contemporary of Crumb. Inspired by the civil rights movement in the US, 'Ten Freedom Summers' was written over 34 years beginning in 1977. Smith uses Ankhrasmation, a graphical method he invented, to write his scores. This notation doesn't exactly give note duration but the whole work generally runs for 4 1/2 hours. This evening the Ligeti Quartet played 'Black Church' - a much more manageable 17 minutes long. 'Black Church' brought to life fragments of songs, conversations and sermonising. A feeling of space at the start was overrun by drones and alarms, and a sense of people all talking at once. But this faded to a slower and more mellow section to end. New Dots' next event is 'Curiouser', based on 'Alice in Wonderland', on 12th November at the Asylum in Peckham.